Are you looking to replace some glass? Get a quote today! We offer a range of glass options and coatings, which are explained in more detail below. Modern glazed products are designed to give you the best possible thermal efficiency. They prevent heat escaping from your home, which saves energy and keeps your heating bills down. The thermal efficiency of a product is indicated by its U-Value. The lower the U-Value, the more thermally efficient it is. All our double and triple-glazed units are filled with Argon gas. This improves the thermal efficiency significantly, keeping the warmth inside and the cold outside. This is standard in all our double-glazed units. It insulates the inside of the frame and prevents condensation from forming around the bottom. 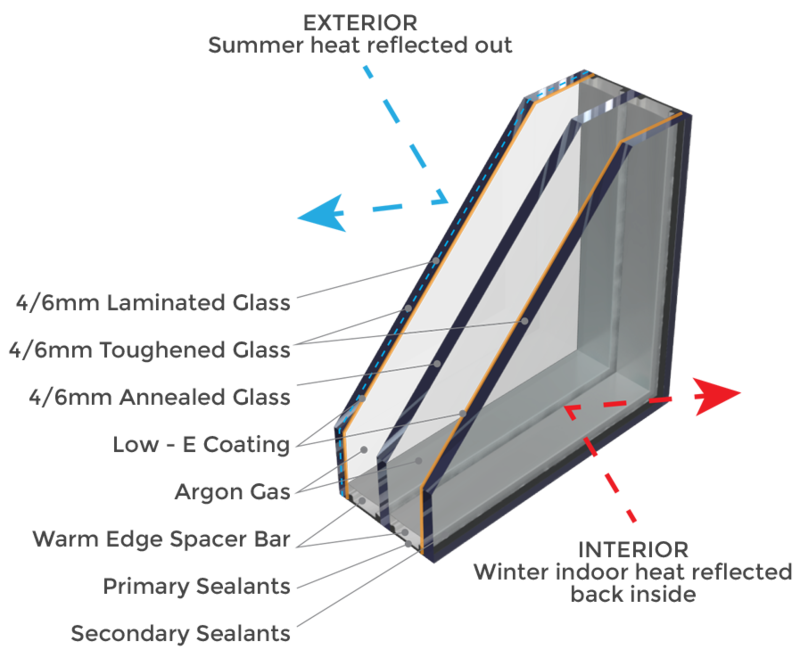 In most double-glazed units, the standard thickness of each glass pane is 4mm. Float glass and toughened safety glass can be manufactured using these 4mm panes. Adding a coating to your glass can improve energy efficiency, reduce the need for manual maintenance and maintain a comfortable temperature. An optional, invisible coating designed to reflect heat back into your room for better heat retention. This coating alone could help you save money on your energy bills. This coating uses UV rays from the sun to break down dirt on the surface of the glass, so the rain can wash it away. During dry spells, a hose down with plain water will have the same effect. To maximise the longevity of the coating, no cleaning products should be used on the glass. The coating is supplied as standard on our roof lanterns and may be applied to other products on request. Direct sunlight on your glass builds heat in your home, creating an effect that is similar to a greenhouse. This coating blocks infrared radiation and maintains a cooler temperature during hot weather. It is particularly helpful if your property is south facing and has large expanses of glass, such as bi-fold or sliding doors. The coating is supplied as standard on our roof lanterns and may be applied to other products on request. If safety and security is a priority, we offer two further glass options. All our doors are glazed with toughened safety glass as standard. The glass conforms to British Standards, as denoted by the kite mark in the corner. Toughened glass is stronger than normal glass and, in the event of a breakage, will shatter into small fragments rather than dangerous shards. This glass is used in cases where safety and security are paramount. Is used to create the multi-storey glass curtain walls you sometimes see in shopping centres. Laminate glass also restricts the amount of UV radiation that can pass through it. The filtered light is much safer on your skin and prevents the sun’s rays from bleaching your furniture.